A Catholic archbishop in Belarus has asked the government to make it easier for foreign priests to work in the country and to return ownership of church buildings to the Catholic Church. 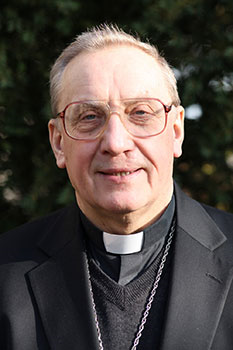 Archbishop Tadeusz Kondrusiewicz, whose diocese encompasses the capital, Minsk, told Catholic charity Aid to the Church in Need that despite the growing number of native priests, up from 60 to 400 in the past 25 years, foreign priests are still needed but face many obstacles in obtaining and extending residence permits. He says an increasing number of priests have been deported, even after years of working in Belarus and often under the pretext of minor offences like speeding. Archbishop Kondrusiewicz also called for church buildings expropriated during the Soviet period to be returned to the Catholic Church. After Belarus gained independence in 1991, he said the Catholic Church renovated many of these buildings, using its own funds, but that the Church currently has to pay rent for their use. He called for the implementation of the restitution laws seen in several other Eastern European countries. Belarus’s constitution guarantees religious freedom, but prohibits activities “directed against the sovereignty of the state, its constitutional system and civic harmony or involve a violation of civil rights and liberties”. In reality, this means the government “tightly regulates religious communities through extensive security and religious affairs bureaucracy that has driven some groups underground”, says the US Commission on International Religious Freedom (USCIRF) in its 2017 Annual Report. President Alexander Lukashenko is often referred to as Europe’s “last dictator”. USCIRF says “officials are particularly hostile toward religious groups viewed as political opponents, such as Protestants. The government strictly controls foreign citizens who conduct religious activity, particularly Catholic priests”. Although there is no state Church, the Belarusian Orthodox Church has privileged status. Around 68 per cent of the population is Orthodox, while Catholics account for around 7 per cent. All religious activity by unregistered groups is banned in Belarus, but the US State Department’s 2016 International Religious Freedom Report says minority religious groups such as Protestants are often afraid to register for fear of harassment. Proselytism, organising or hosting unauthorised religious meetings in private homes, or importing and distributing religious literature can result in fines or imprisonment. But the US State Department report says “many communities remained reluctant to report abuses and restrictions out of fear of punishment”. Although independent, Belarus relies heavily on neighbouring Russia for its energy supplies. The president, Alexander Lukashenko, in power since 1994, is often referred to as Europe’s “last dictator” and is known for clamping down on opposition movements. In March this year armed riot police were heavy handed in their response as protesters called for end to Lukashenko’s 23-year rule. The opposition leader and former presidential candidate, Vladimir Nekliayev, was among the more than 300 people arrested and detained. Belarus has also threatened to follow the examples of Russia and Kazakhstan in banning Jehovah’s Witnesses.